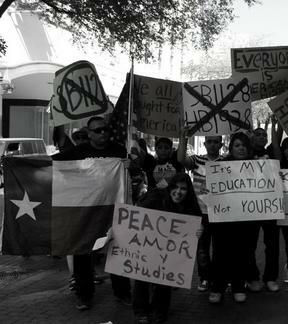 HOUSTON, TX (August 6, 2014) – The same week in July that the Texas State Board of Education (SBOE) sabotaged Ethnic Studies textbooks-saying they would be too expensive, Governor Rick Perry pledged $144 million to send the National Guard to the Texas border. Texas and the nation heard. It was moving to see our community united as we met for our March April 8 on Austin for Mexican American Studies. We could help America a lot more by sending books not troops to the border. However, MAS Texas is not waiting for permission from the State Board of Education to implement Mexican American Studies (MAS). We will soon reach 50 schools in state pilot programs implementing Mexican American Studies in Texas. This will increase graduation rates, more of our youth will go to college. 51% of 5.1 million Texas public school students are Hispanic. We must increase their chances for success-right now. We must not go backwards. Teachers can help tailor the MAS Tool Kit by taking the survey on the web page. They can also submit their contact information to be added to our email list, and they will receive a free lesson plan based on the much anthologized story, "The Señora," by writer Dagoberto Gilb, who also edited the canonical HECHO EN TEJAS. Texas teachers will be entered into a drawing to win a free classroom visit by an author, professor, or community leader during Hispanic Heritage month. Gilb said, "Half of Texas, and more than half the students in its public schools, are Mexican American. Like the Irish in their homeland, MexAms are proud of who we are, of our fathers and mothers and grandparents. We want our children to be so proud of who they are and where they come from, that they take Texas farther than it even imagines." Education consultant Laura Acosta, Librotraficante La Laura, said, "All Top performing schools have several things in common: high expectations, caring relationships, and relevant, meaningful curriculum-which includes MAS for a state that is becoming increasingly Latino." Writer and activist Tony Diaz, El Librotraficante, said, “States should be fast-tracking Ethnic Studies for the simple fact that it boosts graduation rates through the roof. The Cambium Report quantified graduation rates at 98% for students in the Mexican American Studies at Tucson Unified School Distirct. The audit was commissioned by Arizona Republicans who wanted hard evidence to justify eliminating Mexican American Studies. Instead, the truth came out: MAS helps our youth succeed in school. TUSD has the only empirical data in America for MAS K-12 because it was the only school district in the entire country that ever had it. This was the program that Arizona Republicans prohibited via Arizona House Bill 2281. Tucson students are suing the state of Arizona to overturn that law. They head to the 9th District Court of appeals in the fall. However, here in the Lone Star State, MAS Texas in conjunction with NACCS Tejas Foco, Somos MAS, student groups across the state, and schools across Texas will continue to work hard to bring the power of education into our community. Our statewide coalition links members of the community to award winning authors and professors and because of that MAS is quickly spreading. Texas is the center of a literary Reniassance. * We will be coordinating the work of all of our Librotraficante Under Ground Libraries to expand our base in our communities. (http://www.librotraficante.com/Underground-Libraries.html). We are holding a book drive right now for our Under Ground Library in Phoenix at Puente. * We are also working with all major educational institutions. Houston Independent School District, the largest school district in Texas, endorsed Mexican American Studies, as did El Paso ISD, and Ysleta ISD and others, to plan, conduct, and promote curriculums and courses. * All roads lead to the February 2015 National Association for Chicana and Chicano Studies Tejas Foco Conference at Lone Star College-North Harris in Houston, Texas: "Putting More Community in Community Colleges and Beyond," which will feature workshops by and for professors, students, administrators, teachers, families, and policy makers, nd publishers. ​Our Texas, our nation: The story - the whole story - of our state and nation deserves to be told. Update on the Librotraficante Movement. MAS Texas to Share Lesson Plans and School Visits for Free. Next step: 50 Schools Teaching M.A.S. Next School Year. 200 School Districts the Year After. Resolutions and Endorsements for Implementing Mexican American Studies in TX High Schools. Ysleta ISD-First Texas School District to sign on for this campaign. There are many more to post. We can't keep up. . . please send yours.